New Britain, CT. (June 1, 2015) — STANLEY® introduces its new line of FatMax® Simulated Diamond Tip Screwdrivers offering longer tip life over standard screwdrivers used by professionals. Screwdriver tips take a beating and over time become less effective at staying seating in screws. 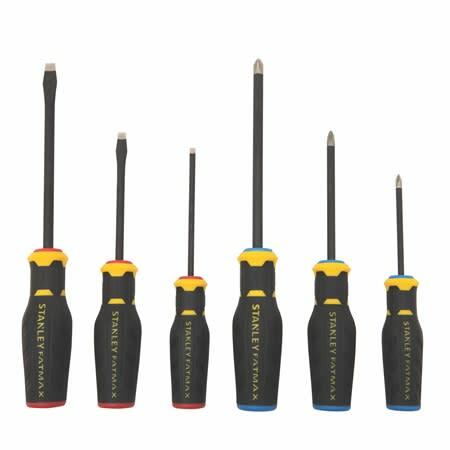 To help reduce slippage and harden screwdriver tips STANLEY® is offering new Screwdrivers with a specialized simulated diamond tip coating for longer tip life. The new screwdriver tips are encrusted with a simulated diamond sand composite to help bite into screws for easy screwdriving and screw removal, especially of stripped screws. The coating for the screwdriver tips is an industrial grade simulated diamond grit known as silicon carbide, which is used in different forms throughout various industries. The simulated diamond grit provides better tip life and helps keep the screwdriver tip remain durable while also helping to remove stripped screws because of the grit composite. The screwdrivers also features black phosphate bars for corrosion resistance. An ergonomic quad lobe design provides maximum tip torque for tough screwdriving applications. Color coded handles make it quick and easy to choose the right screwdriver size for the job at hand.